This section is from the book "The Book Of Talismans, Amulets And Zodiacal Gems", by William Thomas & Kate Pavitt. Also available from Amazon: The book of talismans, amulets and zodiacal gems. "O God of Abraham, Isaac and Jacob, hear mercifully our prayers, Spare those who feare thee, and be propitious to thy suppliants, and graciously be pleased to send down from heaven, thy holy angel, that he may sanctify and bless these rings to the end that they may prove a healthy remedy to such as implore thy name with humilitie. Amen". "Sanctify, O Lord, these rings and graciously bedew them with the dew of thine benediction and consecration, and hallow them by the rubbing of our hands which thou hast been pleased according to our ministry, to the end that what the nature of the metal is not able to perform may be wrought by the greatness of thy grace". "In the name of the Father, Son, and Holy Ghost". 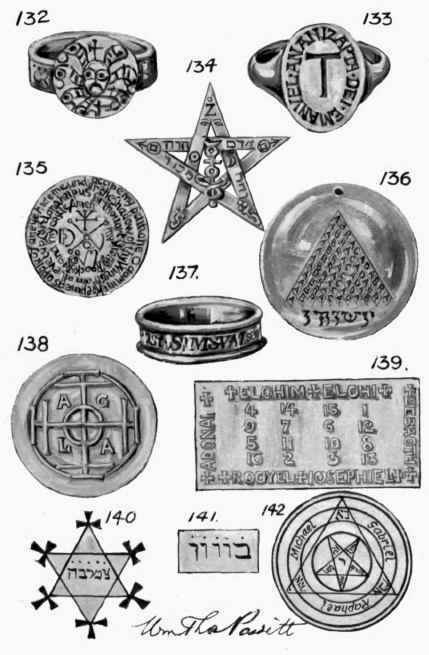 These rings were considered most efficacious if formed out of the screws and nails taken from old coffins, and were frequently considered most beneficial in the cure of epileptic fits if hallowed on Good Friday. This custom, according to Hospinian, took its rise from a famous ring long preserved in Westminster Abbey; this ring had been brought from Jerusalem by Edward the Confessor, and was believed to be efficacious against cramp and epilepsy when touched by those afflicted. Another Talisman ring of the sixteenth century was of Jewish origin, engraved with a Hebrew word "Musseltaub," meaning "We wish you good luck," inscribed inside. "The eye did find, the heart did chuse, the hand doth bind, till death doth loose." "Let Love Encrease." "God did decree the Unitie." "Where Hearts agree there love will be." "Hearts united live contented." "Keep fayth till deth." "I seek to be, not thine, but thee." "Let lyking laste." "Hearts truly tied none can divide". "Joye sans cesse." "Let us be one till we are none." "Fear the Lord and rest content, so shall we live and not repent". "This and the giver are thine for ever". JE, SVI, ICI, EN, Ll'V, D'AMI. (I am here in place of a friend). Diamond placed in sequence round the ring.